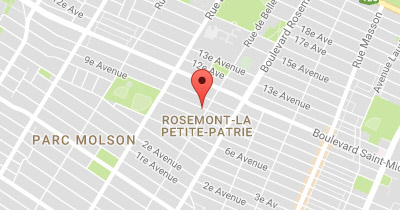 Tonight we decided to venture outside of our downtown/Old Montreal comfort area and head out to chef Martin Juneau's latest venture, Pastaga, which opened last year on a (previously) forgotten stretch of Saint Laurent in Rosemont/La Petite Patrie. Make sure to reserve ahead of time if you want to try this buzzing place, as it was fully-booked on a couple of our preferred nights. 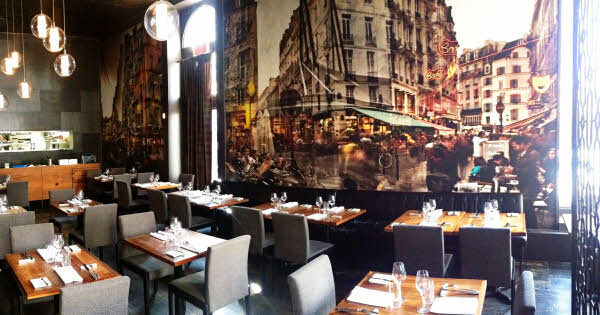 Pastaga's interior is very reminiscent of a wine bar, especially with its unusual L-shaped tables. The place was packed, as was the chef's table (which we would LOVE to be invited to in the future, wink wink Martin if you're reading this). 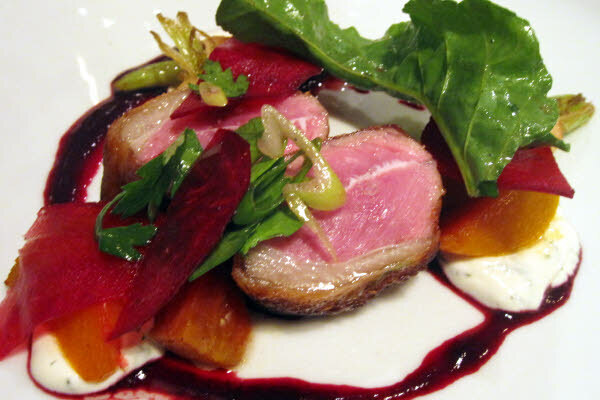 The menu, which is heavy on local ingredients, has no starters or main dishes. 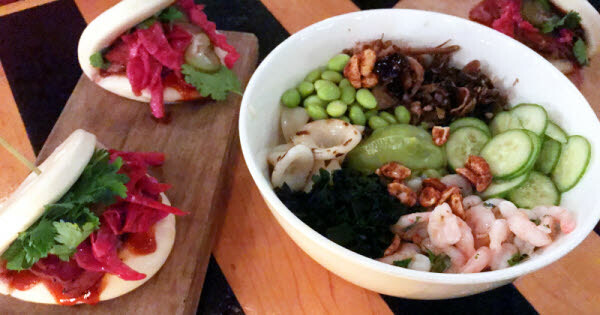 It rather contains a single size of moderately-priced dishes (around $15 each), so one can build their own meal (a great idea for sharing). Our waiter suggested we order two dishes per person, which we did (but later found out that was not sufficient to fill our big appetites). We also went with a bottle of Alsace Riesling 2009 from Audrey et Christian Binner, priced at $50. 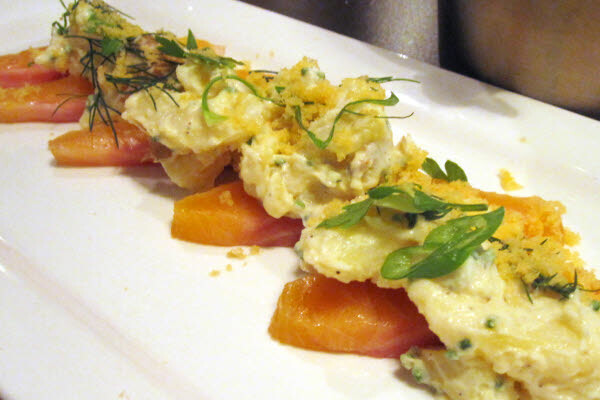 Thick slices of raw fresh arctic char topped with a creamy potato salad and shavings of the dried fish. 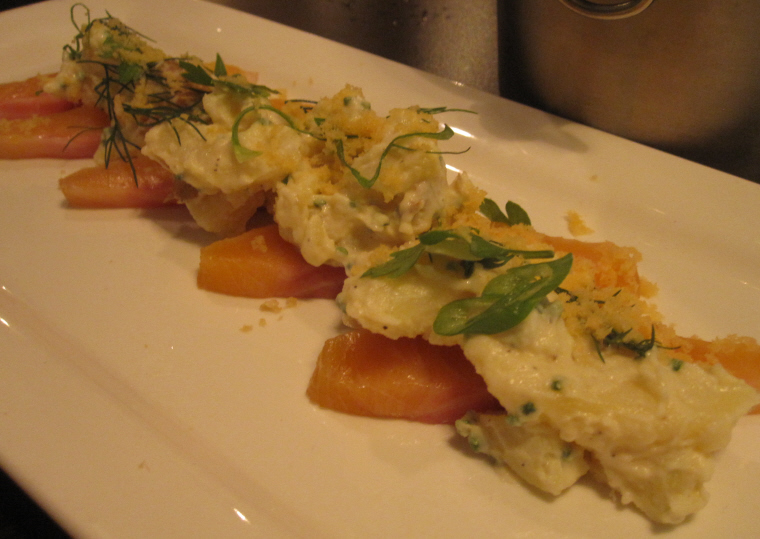 The char was very fresh and sweet, but we thought it was overshadowed by the creaminess of the potato salad. Not an amazing dish altogether, but the individual ingredients were great. "À la mayonnaise, salade de tomates cerises & grissini". 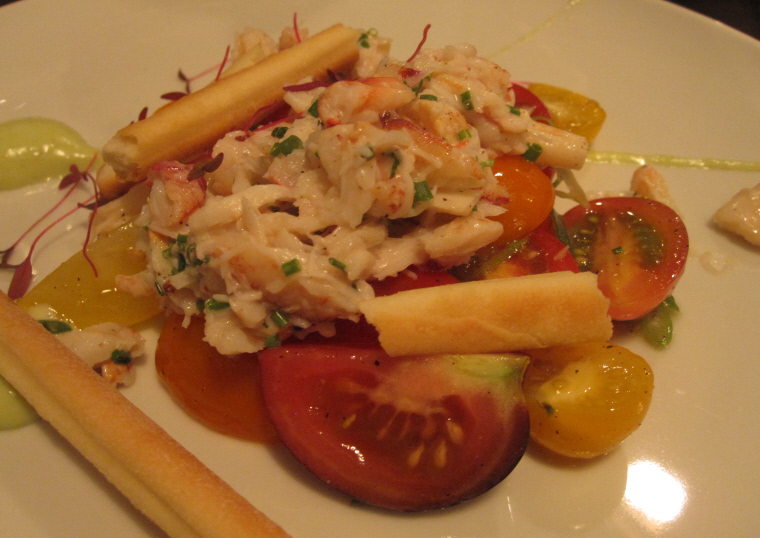 The crab was sweet and succulent and the tomatoes were very fresh, while the scallions added some sharpness. The only problem we had with this dish was the grissini/breakstick that was mealy and soft, as opposed to crisp and dry. 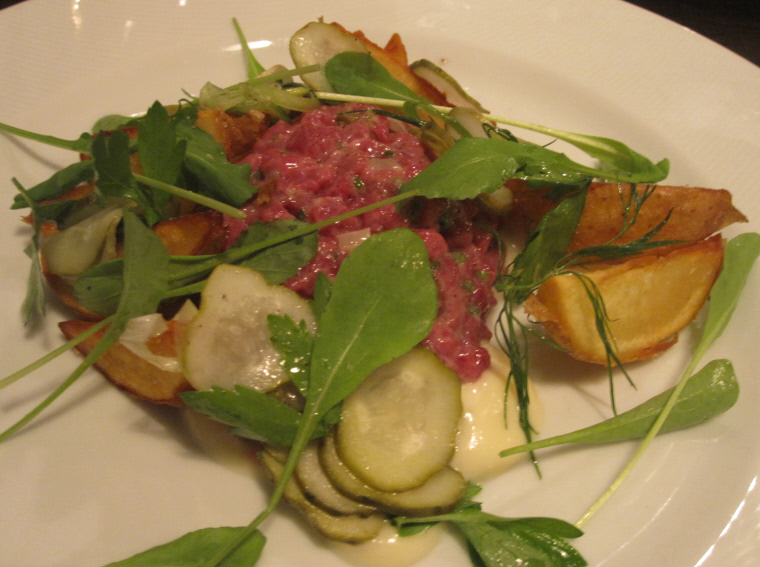 Venison tartar served with sliced dill pickles, fries and garlic mayo. The venison could have used a little more seasoning but the dill pickles took care of that. The garlic mayo and fries were just ok.
Two pieces of lamb, roasted red & yellow beet roots and a baby turnip served with a minty sour cream and grape jus. 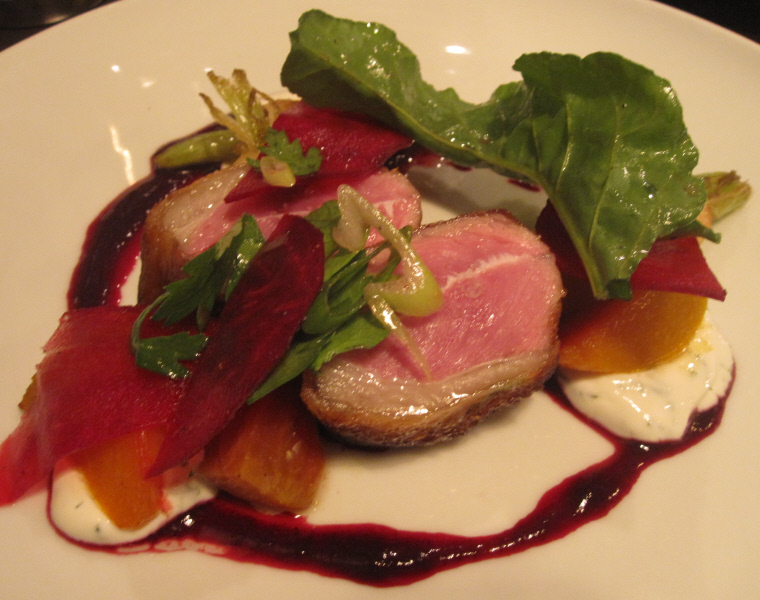 The lamb was perfectly pink and gamey; and the root vegetables sweet and tender. 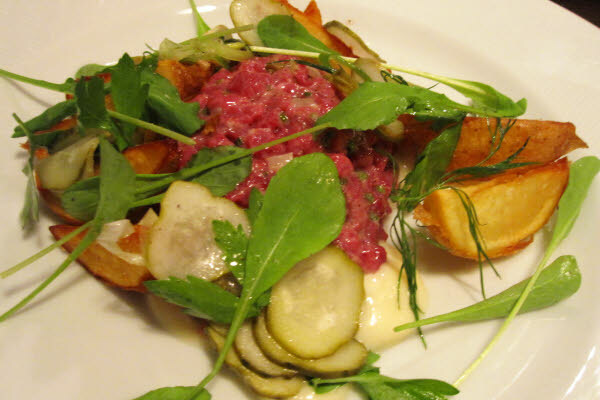 The tanginess of the mint sour cream cut through the rest of the dish's gaminess and sweetness. "Caramel & avoine". 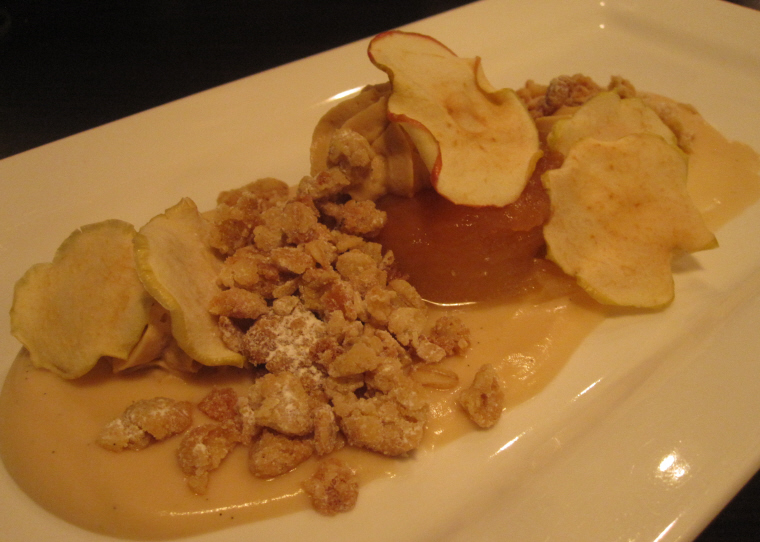 This was kind of a deconstructed apple pie: crispy puffed oats and a mould of pureed apple sat on top of caramel sauce. 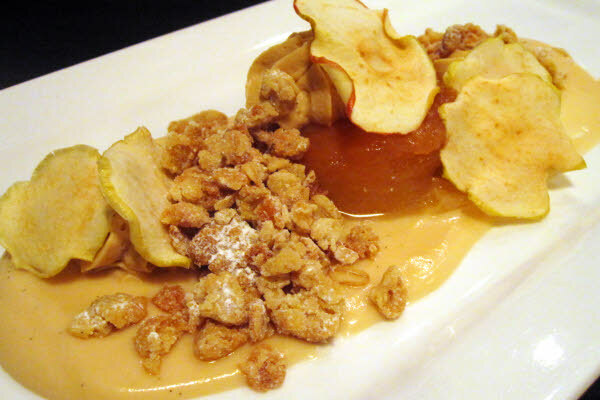 We generally don't like pureed/gelatinous dishes, but the crispiness of the oats added the necessary contrast to the sweet apple puree. tagged: GOOD FOR SHARING WHERE'S THE REST? We were very pleased with the service tonight. It was on the warm and casual side (our waiter was wearing a Cleveland Indians baseball cap), not what you normally expect at a place serving food of this caliber, let alone French food. 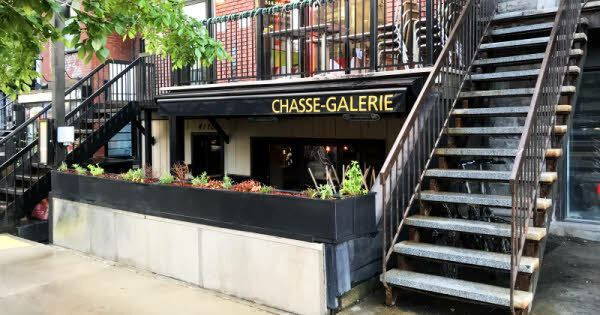 As a side note, tourists and anglos might have a little trouble navigating the French-only menu, but that doesn't bother us, we're just throwing it out there. 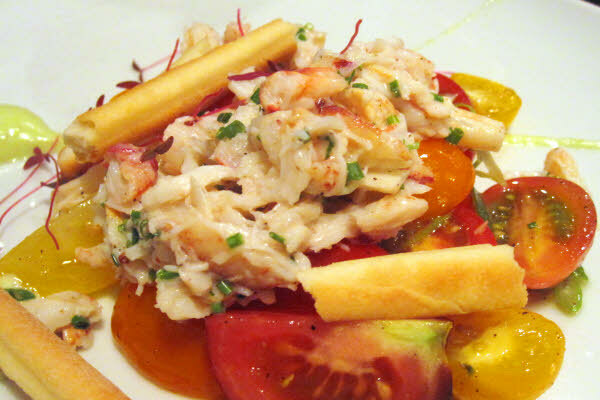 When we heard that chef Juneau had opened up a new restaurant we were reminded of the "late" Montée de Lait. Our expectations grew bigger with the blogger world buzz this new joint was grabbing. 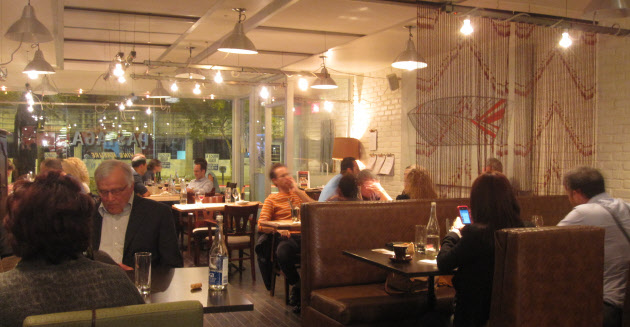 With its cozy decor, friendly service and great food, Pastaga is a nice place for a fine dining experience or to enjoy a few glasses of wine from their natural wine list. Unfortunately we found portions to be on the smaller side, so we ended up grabbing a couple falafel sandwiches after.